Is it just me or is this topic overly complicated, disjointed and overdone in literature? I've tried my hardest to get my head around it, but the more I research the more confused I get. Can I get help putting together and correcting this seasonal, one stop guide SPECIFIC to Black Pines in Australia (needle plucking, candle cutting, major branch removal, wiring, repotting, fertilising etc) and why it's done when it is? I'm hoping the more experienced people can contribute with the less experienced asking the questions. This could be all wrong! Last edited by Daluke on March 27th, 2016, 2:37 pm, edited 1 time in total. Great thread, very interested to see some of the replies. Personally I am interested to hear about peoples experiences growing JBP in areas without a real winter and how this affects the tree. I only have one black pine and find it a very hardy tree. I havent been particular about timing for repoting, trimming etc, and it doesnt seem to mind too much. However it is only a young tree (4 years) and i suppose time will tell. winter/ spring - feed your trees. Stop feeding a few weeks before you intend to decandle. This will probably be sometime in November. Early summer - decandle and remove needles. The new candles will have opened needles by this time. Cut off all candles. Remove all older needles if there are any. Thin out last years needles to just leave 6-8 pairs of needles on every shoot. Summer - new buds will form and grow into smaller candles and should open with smaller new needles. No feeding while new shoots grow. Autumn - new buds should be full size. Thin out new shoots. Cut larger ones from strong areas and weaker ones from weak areas to balance strength of the tree. Aim to leave just 2 shoots at any one place. This is also the time to shorten any long branches - cut back to a side branch or shoot which will become the new terminal shoot. Winter: In Australia, feed all through winter. Personally I prune pines at any time of year. I have not noticed excessive bleeding after pruning. I generally re-pot any time in spring but plenty of great Aussie bonsai growers are repotting in autumn with great success. You can decandle at any time but most growers agree that decandling early will result in the new buds growing larger. I think Grant Bowie has mentioned 100 growing days for new shoots so in cooler places early- mid December. Warmer areas may be able to cut later. In some areas it may be possible to decandle twice in one season? I am getting good results here cutting candles mid December up to Christmas. You can also pluck needles at any time of the year. Removing needles directs and balances energy - It does not matter when you do it. Ryan's regime just does it at the same time as decandling so it is easy to remember and it will get done. I'm also very happy to hear other opinions and treatments. Please let me know if anything above is not correct or more needs to be added. There are a huge number of variables and you can do all kinds of things. I would only suggest a couple of things. I have never given winter feeding. The tree is not growing apart from a few roots so it's demand for nitrogen is very low so if it has good colour (which it should have) no food necessary for those 4 months. Feed strongly in spring and stop after removing the first new shoots of the year. Feed very lightly or not at all until the second shoots have fully matured. Then resume normal feeding. treeman wrote: There are a huge number of variables and you can do all kinds of things. Treeman a few questions with your points. Is there a benefit with fertilising pines with high p levels for the roots in winter? Do you say don't fertilise when you cut back shoots as you are going to get longer candles and longer internodes? How do you remove shoots to promote buds-do you pluck or cut the needles leaving the sheath? No we don't fertilise in winter,the fertiliser will not be taken up by roots, the tree is in full dormancy,this could damage root system and the fertiliser is then/only leaching out the pot wasting fert and money. We do not fertilise any growth that is setting/not hardened off,....ie Autumn growth that we set up in summer and spring growth candle to open shoots,when hardened off then fertilise. anthonyW wrote: We do not fertilise any growth that is setting/not hardened off,....ie Autumn growth that we set up in summer and spring growth candle to open shoots,when hardened off then fertilise. Why? Is it to avoid longer candles, longer needles and longer internodes? Correct...not so much long spring candles, but thick course ones that cause long inter-nodes,which lead to unwanted thick branch-lets,plus as you mentioned long needles,especially in Autumn when looking its best.Hope that helps. Look at it this way...we prep for the race(fertiliser),run the race,exhausted(setting/growing).Prep again...and so on. Last edited by anthonyW on March 27th, 2016, 8:51 pm, edited 2 times in total. I think for most of Australia our winters are not cold enough to totally stop growth like most of the info you read coming from other climates. Ie. no snow no sub minus temps. As a result mild feeding probably helps a tree really jump out if it's skin come spring. This May or may not be desirable depending on the trees development. Jow wrote: I think for most of Australia our winters are not cold enough to totally stop growth like most of the info you read coming from other climates. Ie. no snow no sub minus temps. As a result mild feeding probably helps a tree really jump out if it's skin come spring. This May or may not be desirable depending on the trees development. I agree, Where I am in western Sydney, my pines a junipers grow all year round. Grants pine growing thread here viewtopic.php?f=131&t=17981&p=214021&hilit=+grant+pine#p214021 indicates tat fertilising over winter is beneficial for them. The question you want to ask yourself in light of that is whether winter feeding is beneficial or not. Overly aggressive spring growth can lead to branch thickening at the tips. It is ping to come down to the size of tree, point of development an a bunch of other factors. I would certainly feed weaker trees over winter. Low N food of course. The question you want to ask yourself in light of that is whether winter feeding is beneficial or not. Overly aggressive spring growth can lead to branch thickening at the tips. It is going to come down to the size of tree, point of development an a bunch of other factors. I would certainly feed weaker trees over winter. Low N food of course. Last edited by Jow on March 28th, 2016, 11:28 am, edited 1 time in total. what fertiliser or combo do you use Jow for Low N for winter feeding? No there absolutely no need for high P when feeding pines. It's a good way of reducing mycorrhiza as it hates too much soluble P in the medium. Use native ferts or organic. 1% P is plenty. Too much N available at the time the shoots are extending leads to long needles. Once they are matured, they cannot grow any longer. If you have good colour in the needles, the plant has enough N. Remember that all plants store N P and K to be used as needed. 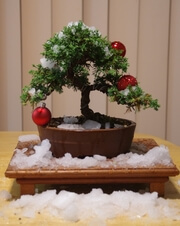 Giving more is fine if you want the plant to grow to full potential but that's not what we want in bonsai. We want full control - or as much as is possible. If you have deep green needles at the end of autumn, giving more will only be stored by the tree and lead to excessive growth (long needles) later on. By removing shoots, I mean cut off all the growth from spring/summer in the autumn without touching the tree otherwise and even more if you want. Of course excessively long candles should probably be broken in half. That's only for young strong trees not formed bonsai. Last edited by treeman on March 28th, 2016, 12:21 pm, edited 1 time in total. bki wrote: what fertiliser or combo do you use Jow for Low N for winter feeding? What ever is on special. Fert timing and understanding why and when you are applying it is the important factor.